But beyond his astonishing feats of language and dramatic impact, Shakespeare also left us a legacy in the explorations of suffering and transgression offered in the six great mature tragedies—Hamlet, Othello, King Lear, Macbeth, Antony and Cleopatra, and Coriolanus—that make up the astonishing body of work he produced from 1600 to 1608. This series of 24 exciting lectures from an award-winning teacher takes you deep within each play to observe Shakespeare's protagonists struggling to make choices in the face of competing social, moral, and psychological pressures and "clawing [from] their pain and horror," as Professor Kinney puts it, " [to] a kind of insight." Whether you're a veteran lover of Shakespeare, someone new to his work, or an old lover returning after too long away, you'll find this course a delight, as Professor Kinney offers insights that give you a nuanced understanding of each play's meaning. It's a gift that will increase the dramatic impact of every Shakespearean tragedy you see on the stage or screen, or visualize as you read them, as well as enhance your ability to form insights on your own with each reading or performance. Professor Clare Kinney does an excellent job of bringing fascinating insights to each of the plays she speaks to in this course. Her lectures are well structured, the information is accessible for the lay reader and above all, these lectures will invite and encourage those who have only a high school or college course experience with Shakespeare's tragedies to invest the intellectual energy toward a deeper understanding of the plays. Note that she doesn't speak to Romeo and Juliet, but (wisely in my view) includes Antony and Cleopatra. However, it would have been excellent if she had included both, in addition to the most popular tragic plays. Undoubtedly, she would also treat R & J with expert analysis as well. She left me curious and wondering what she would have to say. I wish that producer of The Great Courses would have left out the music and clapping between each lecture. I find that a bit annoying and that it adds nothing to the audio experience. What other book might you compare Shakespeare's Tragedies to and why? Harold Bloom: Shakespeare: The Invention of the Human. Brilliant insights into what Shakespeare means to us today. Which character – as performed by Professor Clare R. Kinney – was your favorite? Prof. Kinney effectively weaves dialogue from the plays throughout her lectures. In the final lecture about Shakespeare's last works, she was obviously touched by the plot of The Winter's Tale and the redemptive power of the spirit to move past tragedy. I would have paid college tuition to attend this series of lectures. Don't miss it. What did you love best about Shakespeare's Tragedies? Although, the words delivered are so extraordinarily tragic, the speaker enriches the meaning profoundly ten times over. 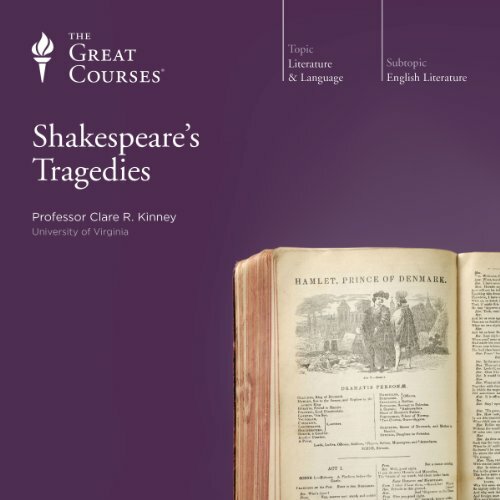 As I listened to King Lear and other tragic Shakespeare stories told by Professor Kinney, I realized how engulfed I quickly became as each word echoed through her enriched my understanding of what I had previously known of Shakespeares tragedies. I love that Shakespeare Tragedies can connect me with the production and the performance through words. Professor Kinney has such an eloquent voice to enhance the tragedies. More than ever my favorite character would be King Lear. Ha! King Lear, his daughter's and Edward, this character list helps to enhance the story of Lear as he comes to terms with the laws of justice.We are offered a glimpse at how it could feel to be faced with consequences of our actions and be at odds with our own personal conscience. Naturally, there are several choices, conflicts, and political situations which are surrounding Lear throughout his clash as he is forced to reflect on human laws and moral laws. How many times I've said to someone, we see, but we don't see what we are shown. Have you listened to any of Professor Clare R. Kinney’s other performances before? How does this one compare? No, I've never listened to Professor Kinney's performances, but she far outshines most professional female speakers. I do have favorites, but she ranks up there with the best. Professor Kinney is the perfect individual to read this audio book, perhaps more are in store for her, and her next move in life will be in this genre of literature and entertainment. Her explanations and comments offer a true analysis of each one of the Shakespearean stories in this Great Courses Course (sounds redundant, but it is what it is). Ok, so Professor Kinney, has such a sweet voice, soothing, enhancing of every Renaissance piece spoken in contemporary productions. She has a knack of using the verbal text and shifting into a visual image in order to relate and heighten the stories.Even characters who murder, such as in MacBeth, I'm assuming if you've read MacBeth, who are the most unscrupulous, despicable, revengeful individuals can be thought of as fully developed through Professor Kinney's descriptions. I did cry at the end of her reading Othello, but this is true of every time I come to the end of Othello. In this story, we know that Shakespeare had the ability to convey such a range of emotion in a very piece, that we really do not know how to react until it happens. I never understand in its entirety the feeling of jealousy, but it too is an emotion that is drawn upon in such a provocative way that we begin to reflect upon our lives. This course, is such a powerful read, that I cannot recommend it any higher than I have, but if it were possible I would like to say thank you. The professor gives a lot of interesting insight into the plays. Other lectures will get into the more technical aspects or the plays. But this felt more like a discussion about the plays themselves, which was delightful. Would you listen to Shakespeare's Tragedies again? Why? Probably not. I wanted a launching off point and this was it. I didn't always know where to focus my attention in reading Shakespeare's plays on my own. The wordplay and vocabulary present stumbling blocks to a new reader. Prof. Kinney introduces the important themes, as well as key lines, and when you read the plays alongside the course, comprehension is less of a challenge and the timeless themes of the work emerge. As a native English speaker, comprehending Shakespeare was a reward by itself. Every other form of literature opens up. I like Hamlet and Coriolanus. Hamlet is a sympathetic character who seems trapped by fate and his soliloquies on death and existence are some of the most famous lines in English literature. Coriolanus is a talented warrior turned politician undone by his own arrogance, which seems to be a timely political theme. Incisive passionate and fascinating lectures given by a talented communicator. She spoke Shakespeare's language like a first rate actor. Loved every minute! An excellent lecture series on the tragedies. Kinney is clearly passionate about her subject. Her reading of quotes was masterful.